Finding a decent meal in airport can be downright depressing. You’re hungry, you’re in a hurry, and you’re spending the next few hours cramped in a small space with people you don’t know. My travel brings me to Chicago O’Hare airport on a regular basis and it’s amazing how the food offering at the terminal has evolved over the years. In fact, I’m quite happy to have a connecting flight via ORD because of the food. Imagine that! 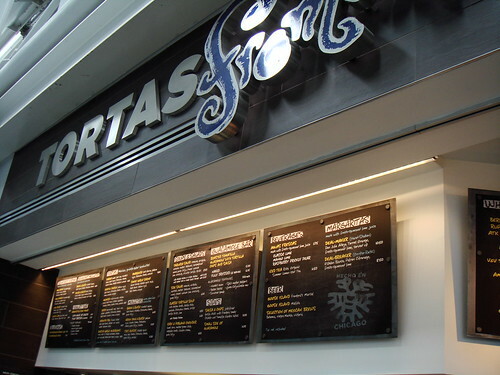 My favourite spot of all is the newly opened Tortas Frontera by Rick Bayless. Located in concourse B next to the McDonald’s (terminal 1 B11), this latest addition to the terminal is my must stop for meal on the go. Made-to-order Mexican griddle-baked sandwich is the attraction here all washed down with fresh tortilla chips, guacamole bar, and selection of agua fresca. The sandwiches are made with bolillo or telera breads and generously stuffed with your choice of protein and complementing accompaniment. Last weekend I enjoyed a Cubana and a Pepito. The Cubana is filled with smoked pork loin, Nueske’s bacon, black beans, Chihuahua cheese, cilantro crema, chipotle mustard, and avocado. I unpacked the box at the restaurant with the intention to take a photo in natural light. I had a plane to catch and really ought to eat my sandwich after boarding. The smoky aroma and the warmth from the crispy bun were too difficult to resist. I bit into the sandwich and the thin crunchiness of the crust shattered beneath my teeth. The filling was a marriage between smoky, smokier pork and cool creaminess. I could not stop at just one bite and finished half a sandwich in record time. On my return trip, I had to return to Tortas Frontera for more. 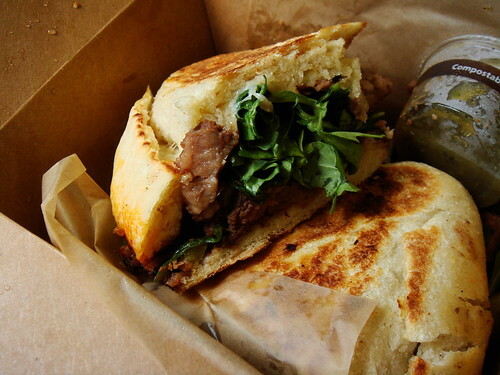 The Pepito contains beer-braised beef short ribs, pickled jalapenos, Chihuahua cheese, black beans, cilantro crema, and arugula. This one is for fans of spicy food as the pickled jalapenos had quite a kick. The beef short ribs were juicy and tender. Notice the different bun used for the two sandwiches? The more substantial bolillo soaked up the jus while keeping the griddled crust crispy. 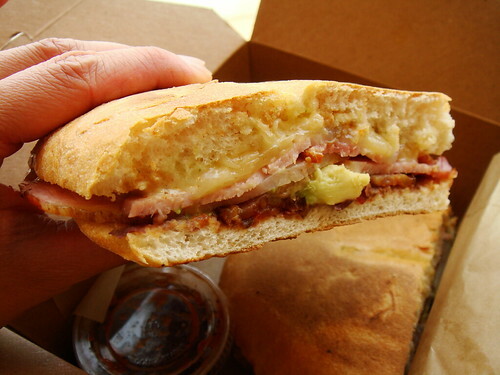 My mouth waters just thinking about this sandwich. My only complaint is that all the tortas are made-to-order and thus requires 10 minutes of wait time. If you’re pressed for time between flights, it’s best to place your order first thing and then take your bathroom break while your sandwich is being made. Another reason that endears me to O’Hare is Vosges Haute-Chocolat boutique, also located in B concourse (I’m a United girl). The product of this Chicago-based chocolatier can be found nation wide but there’s something special about visiting their boutique with the full range of products available. The last time I visited, there was a promotion for their chocolate tablet so I bought six for the price of five. 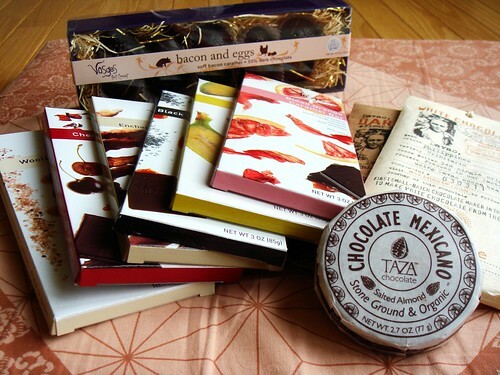 The box of Bacon and Eggs chocolate was an Easter special. Each dark chocolate egg was filled with soft bacon caramel. Such decadence! 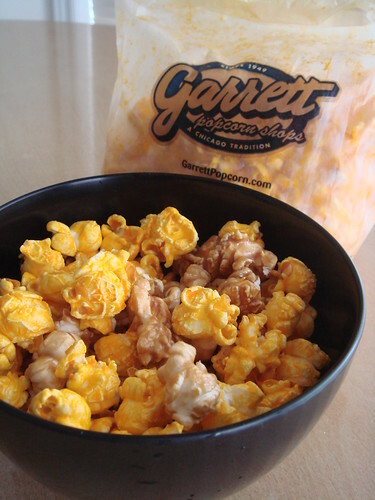 Garrett Popcorn is another store I love to visit in the airport. There are multiple locations but one thing that’s always the same is their Chicago mix. I didn’t think I would love the sweet and salty combination of caramel and cheddar cheese popcorn but it is in fact ridiculously addictive. The cheddar cheese flavour is especially good because it is made with real cheese! A word of warning: grab extra napkins! The cheese stains my fingers yellow every time and napkins are mandatory when you’re munching away on the plane. For my caffeine fuel, my choice definitely goes to Intelligentsia Coffee. There is no Intelligentsia cafe inside the terminal but it is served in various cafes. In addition to the stops I mentioned above, I have yet to try Eli’s Cheesecake. I also remember seeing Italian Beef being served. 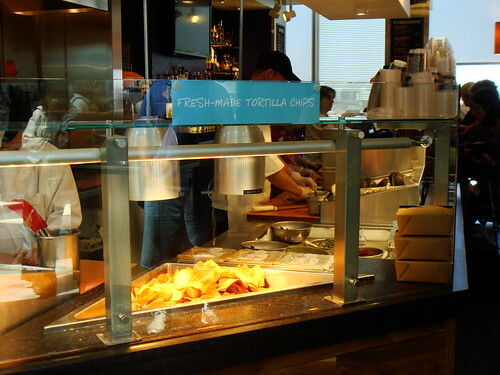 One thing is for sure, I’ll not go hungry in O’Hare!